As a dual boiler machine, there is both a 0.75 liter boiler dedicated exclusively to brewing and a 2 liter boiler dedicated to steaming. Both boilers are made of stainless steel and wrapped with thermal insulation. The boilers have been bolted to the frame of the machine for structural stability but are easily removable, an element of the highly modular internal design that allows for easy servicing and repair. Brew pressure is provided by the powerful RPM motor and rotary pump which cuts down on the noise produced by the brewing process and allows you to connect the the machine directly to a water line or use the 3 liter water reservoir. 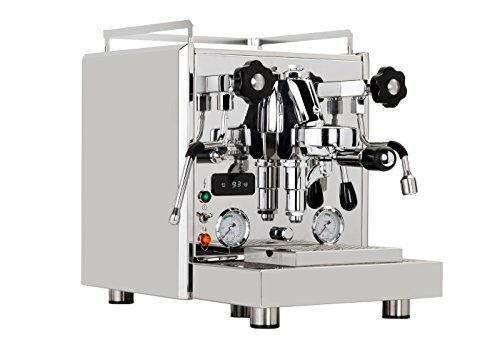 The last facet of the brewing process, the E61 brew group is made of solid chrome plated brass and is constantly heated by a thermosyphon system to ensure maximum temperature stability. This unit has an insulated steam wand with a four-hole steam tip. The hot water wand is similarly insulated to help prevent accidental burns. The benefit of these valves is that they don't need to be fully opened or closed to regulate the flow of steam/water. The way it works is that by turning the knobs, pressure is either added to or released from a spring that holds the valves shut. This prevents you from having to rotate the knobs numerous times to open or close the valves. The manual three way valve which is controlled by the brewing lever drains any excess pressure and water directly into the 1 liter drip tray, keeping the internal components dry. A unique and desirable feature of the Pro 700 is its front mounted dual boiler PID display that monitors both the brew and steam boiler temperatures and allows you to adjust both, a beneficial feature that allows you to achieve more precise brewing conditions to extract certain notes and flavors from different coffees. PID has its built-in shot timer that switches on when you begin brewing. The front of the machine also sports dual pressure gauges that monitor both pump and boiler pressure.